Our colleague, Paul Oki, sent this note from Nigeria a few days ago: Would it surprise you if I told you that even now it's not unusual to find cars with Obama campaign stickers plying our roads? Or that there were billboards in prominent places with "Obama for President" in some of our major cities? Or that on inauguration day several companies took out full page, color adverts in our national newspapers congratulating the American people? We all feel like proud Americans at this point in history -- I can't express it any better. 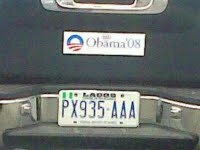 He also sent the photo, above, showing the back of a passing car in Lagos. Does slapping a huge "crime tax" on public companies make sense? First Siemens for $800 million; now Halliburton, apparently, for almost $600 million. We're always in favor of more enforcement and less bribery. But corporations, as we've said, can't defend themselves against FCPA charges. And it's the powerless shareholders who ultimately pay. Imposing stiff compliance obligations on offending firms is a good idea. Prosecuting culpable executives is even better. But these mega-settlements -- is anyone else uncomfortable? The Wall Street Journal nailed it. "World Bank Omerta" is how it headlined the bank's indefensible practice of keeping quiet about suppliers guilty of corruption. A Journal editorial this week said, "[W]e are left to wonder whether the fraud at Satyam might have been discovered earlier if the World Bank had been more forthcoming about what it already knew to be a corruption-prone enterprise." We wonder -- will anyone try to sue the bank for breaching its duty to the public? There's precedent for ex-Gov. Blagojevich's bizarre road show earlier this week to New York City. Earl Long (Huey's younger brother) made a couple of similar trips when he was governor of Louisiana and under a few clouds of his own. In 1959, A. J. Liebling spent time with him and wrote about it in The Earl of Louisiana. The book opens with these wonderful words: "Southern political personalities, like sweet corn, travel badly. They lose flavor with every hundred yards away from the patch. By the time they reach New York, they are like Golden Bantam that has been trucked up from Texas -- stale and unprofitable. The consumer forgets that the corn tastes different where it grows."